1. Lord, in Thy Name we spread the sail, Sailor’s Hymn. This hymn is included in his Poems, 1868, p. 268, but is of unknown date and origin. The hymn, "While o'er the deep Thy servants sail," is an altered form of this hymn to be sung on behalf of sailors. It was apparently rewritten for the Connecticut Psalms and Hymns, 1845. 2. The harvest dawn is near. Ps. cxxvi. From his version of Ps. cxxvi., Book of Psalms, &c, 1839, beginning with st. v. Also his American Metrical Psalter, p. 250. It is widely used. 3. The floods, 0 Lord, lift up their voice. From Ps. xciii. in his Book of Psalms, 1839, stanza iii., found in his American Metrical Psalter, p. 179. 4. When forth from Egypt's trembling strand. Ps. cxiv. From his Book of Psalms, 1839, and Psalter, 1864. It has been included in Spurgeon's Our Own Hymn Book, 1866. 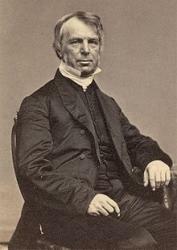 George Burgess (October 31, 1809 – April 23, 1866) was the first Episcopal bishop of Maine.